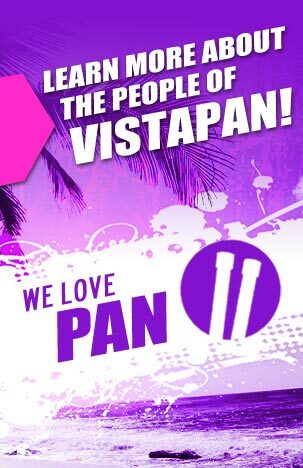 Welcome to VistaPan Steel Instruments. We are the price leader for full size, high quality steel pans (steel drum) instruments. All of our instruments are handcrafted in Trinidad, where the steel pan originated and is known for having the best pan tuners and makers in the world. The pans do not come off an assembly line and each pan will have some tool markings and small imperfections present which are a natural component of the normal appearance of these handcrafted instruments. We are so sure you will be satisfied with the quality and sound of our instruments, we offer a full money back guarantee. Others may offer you souvenir or smaller sized instruments at our prices, but there is no need to settle for a lesser product. You can purchase a full size, high quality VistaPan steel instrument. We also have available package pricing for Schools and Universities. Our commitment to the highest standards, in all facets of production and distribution combined with determination in bringing you outstanding instruments at the best prices, will make us your only choice for steel pans. From Japan to the U.S. and all points worldwide, our service is unparalleled. Check out what customers have to say about VistaPan!